This weekend was the opening of the annual Tall Ships exhibit at Studio 23 in Bay City. This was my first year entering, and I was excited to have both of my pieces accepted. The elements of nature in my artwork tend to be way more enchanted forest than nautical or aquatic, but I decided to challenge myself to work outside of my usual themes. The piece on the left, “Underwater Dreaming”, may be the most colorful piece I’ve ever created. It’s very tropical which is out of my norm, but maintains the elements of fashion and surrealism that I so love. The piece on the right, “An Existence Aquatic”, was created two years ago when I was in a watercolor and ink illustration phase, and has a steampunk-mermaid feel to it. For a step-by-step look at how “Underwater Dreaming” was created, please visit my previous post. These pieces are available in print form in both my eBay Store and Redbubble Shop. This Is Why You Should Keep Old Work Forever. 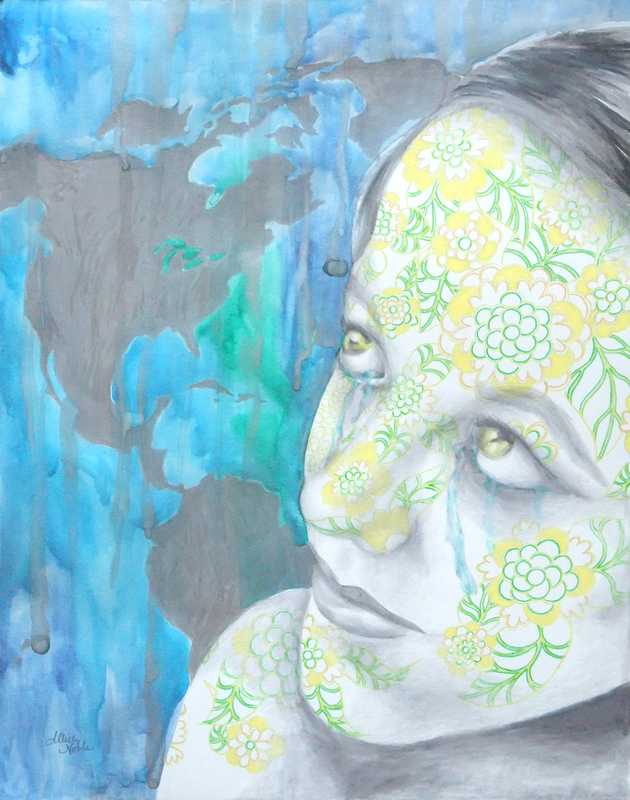 For about 2 years, I had an 11×14 piece of bristol board with this woman’s face covered in flowers on it, and a metallic silver world map view behind her. She was surrounded by nothing else but white space. I was convinced it looked absolutely horrible, and I had no idea what to do with the rest of the background. I chocked it up to a loss and tossed the drawing in my storage portfolio case. A couple times I ran out of paper and thought about just using the back of it when I had a new idea and didn’t want to delay inspiration with a drive to Michaels for more bristol board. Other times I almost chopped it up into pieces for scrap paper to sketch ideas onto. I thought of posting it on my artist facebook page as a giveaway for whoever wanted it, and letting them color all over it like crazy to see what happened; an impromptu collaboration over vast distances. Luckily, I never did any of these things. 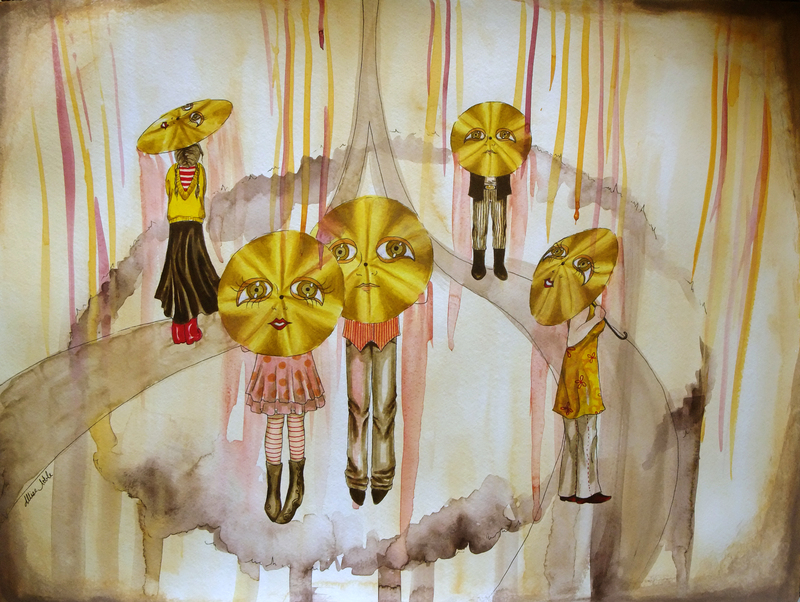 I’ve been doing a lot with watercolor lately, and was wishing I had one more piece to hang in my upcoming exhibit. I didn’t have the time to start anything else from scratch, but when I found this I decided to play around with the background and see what happened. I spontaneously dripped blues and greens and metallic silvers over the entire background, throwing the paper this way and that to guide the drips. Once I stopped over-analyzing and worrying over how terrible I thought my piece looked and just started enjoying the process again, everything came together. Sometimes even something as subtle as a bold color splashed into the backdrop can turn an entire piece around. Mine went from a drawing of a girl who looked like she had a strange, alien, flower-shaped skin disease to a pretty nice finished piece. This is why I cannot emphasize enough, don’t toss out old, unfinished work! Paper is flat, it keeps pretty easily. I’ve my seen students do some really cool things with incomplete projects they could have tossed away. In this piece below, a student cut out elements she liked from a “practice” acrylic painting from the semester before that didn’t really turn out. These made for some great smaller blooms popping out around the central focus of the pumpkin. Even if you don’t end up turning the leftover physical piece into anything, something half-finished could at the very least provide an idea or concept for a project you do later. 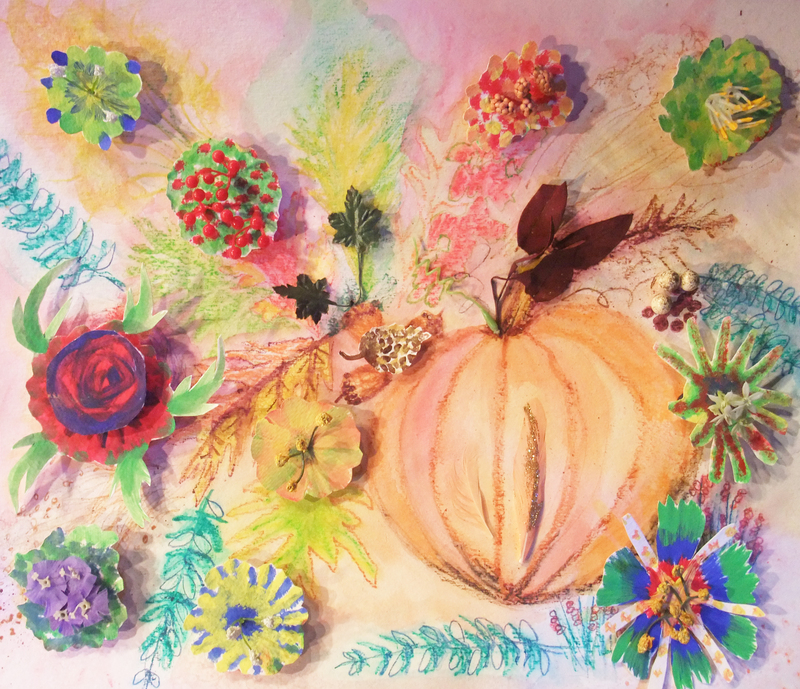 Nancy’s autumnal mixed media, salvaging cutouts from an old acrylic practice lesson the semester before. I’m actually constantly revisiting old work, even from as far back as high school. Most of that is also unfinished because I, like any teen, had a real short attention span. This painting, which my mom fell in love with and now has hanging over the sofa in my parents’ living room, was created from scratch in 2012. But, it was based on an old colored pencil drawing from 2005 that I never finished shading in. The particular sketchbook the original drawing was in is still in the closet of my old bedroom in my parents’ house or I would post it here, but it was a color scheme of entirely red and black and the parasol people were dressed in old-timey but super goth attire, and the faces on the parasols looked like they could all be members of a My Chemical Romance copycat band. Trust me, it was something else. Behold, the reboot. Now that I’ve turned you all into hoarders, I have one more all-together new piece I’d like to share. 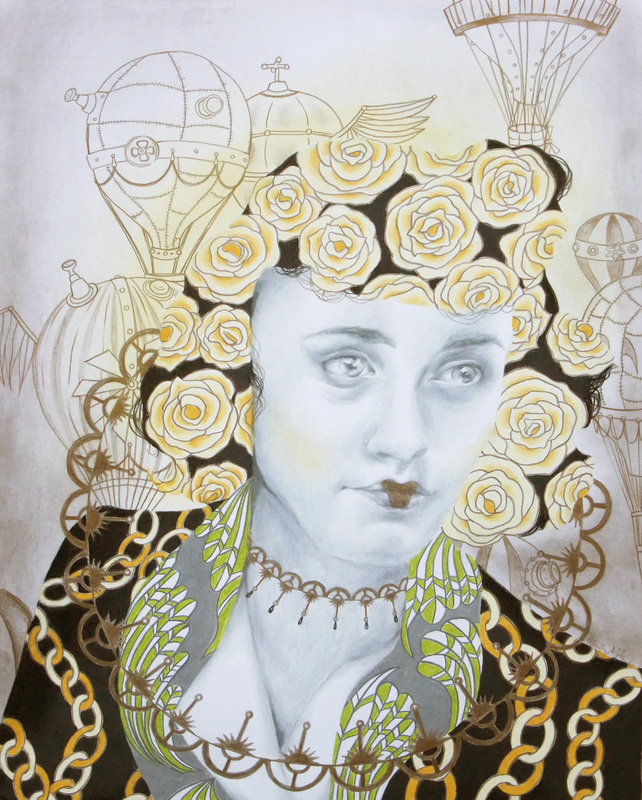 I have always been deeply interested in the steampunk aesthetic, but never created any steampunk-esque art myself. This is my first, and I’m pretty excited about how it turned out. The deep gold is metallic, though you can’t tell in the digital image. I was heavily inspired by the Victorian aspect of Steampunk, even turning the classic Victorian lace pattern into something metallic and industrial. I am finally going to be hanging all of these pieces up tomorrow in Espresso Milano, and will be sure to take pictures. Have any cool steampunk art you yourself have created or that you’ve seen by other artists? Throw me a link! I am a long time appreciator, but creation-wise, a novice. As I’ve promised, photos soon!